It's being called the largest, strongest, and most dangerous hurricane to ever be recorded — not in the area it's on course to hit, but in the entire Western hemisphere, and some are even saying ever, in the history of the world . According to meteorologists, Hurricane Patricia has earned these superlatives because of its intense 200-mph sustained winds, which, along with accompanying torrential rain, is expected to do serious damage to Mexico's Pacific coast on Friday afternoon. To get a sense of just how insane this storm is, take an uncomfortable glimpse at Hurricane Patricia's spine-chillingly scary satellite images. One look and you'll understand why this storm is breaking all kinds of records, and why even astronauts are terrified. As it makes its way to Mexico on Friday, Hurricane Patricia is currently a Category 5 storm, which is the highest category possible, meaning its wind speeds have exceeded 156 mph and the storm could cause "catastrophic damage." Patricia is expected to stay a Category 5 storm when it reaches landfall in Mexico between 5 and 6 p.m. CT. Meteorologists predict that the storm will cause heavy, "life-threatening" flash flooding, power outages, 40-foot wave surges, and "life-threatening rip-current conditions," possibly amounting to "the most devastating storm to ever hit Mexico," according to NBC News Meteorologist Bill Karins. The eye of Patricia is expected to pass through the Mexican state of Jalisco, where the popular resort city of Puerto Vallarta is located, and Guadalajara, Mexico's second-largest city, on Friday afternoon or evening. As tens of thousands of residents evacuate the affected areas and officials brace for literally the worst storm in history, it's important for others who will not be affected to grasp the severity of the situation — if not just to keep abreast of global events, then to offer some messages of solidarity with those who will likely see unimaginable damage to their homes and towns and prepare to offer immediate relief aid. 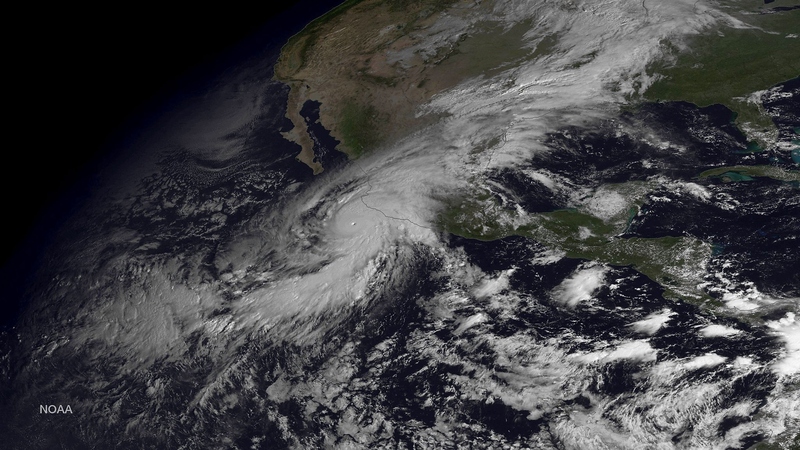 Take a look at these 11 satellite images of Hurricane Patricia to truly understand how menacing the storm is.